Renee Cryer, Eaton Van Wert contributions team member; Dee Densel, Eaton Van Wert contributions team member; Ashley Bultemeier, Westwood Behavioral; Krista Somerton, Junior Achievement; Scott Mull, Junior Achievement; Cory Michaud, Junior Achievement; Craig Hill, Eaton director of manufacturing operations; Jill Luginbill, Eaton engineer and Junior Achievement volunteer. Submitted photo. 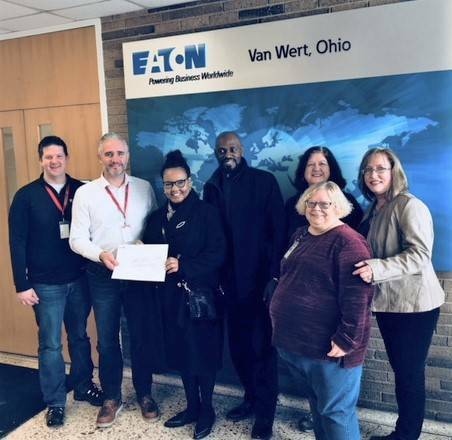 Shawn Wrathell, Eaton Van Wert HR manager; Craig Hill, Eaton director of manufacturing operations; Joycelyn Burks, UMADAOP housing coordinator; Marcell King, C.O.O. , UMADOAP; Dee Densel, Eaton Van Wert contributions team member; Renee Cryer, Eaton Van Wert contributions team member; Erika Lobsiger, Eaton Van Wert contributions team lead. Submitted photo. Jay Albayyari, Ph.D. -Wright State Dean and Chief Administrative Officer, professor of mechanical engineering; Gretchen Rentz-Wright State; Shawn Wrathell-Eaton Van Wert HR manager; Kathleen MacDonald -Eaton Van Wert OPEX Manager contributions team member; Renee Cryer- Eaton Van Wert contributions team member. Submitted photo. 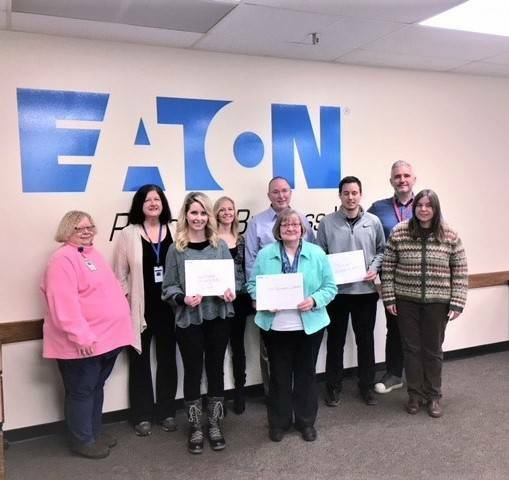 VAN WERT — The Eaton Corporation donated $100,000 to area charities through its Eaton Charitable Fund. Donations include: $45,500 toward Wright State’s new advanced manufacturing center; $35,500 toward UMADOP’s Phoenix Project; $3,000 toward West Wood Behavioral Health’s Signs of Suicide program; $6,000 toward the Van Wert Brumback Library’s summer reading program; and $10,000 toward the Van Wert area’s Junior Achievement program. 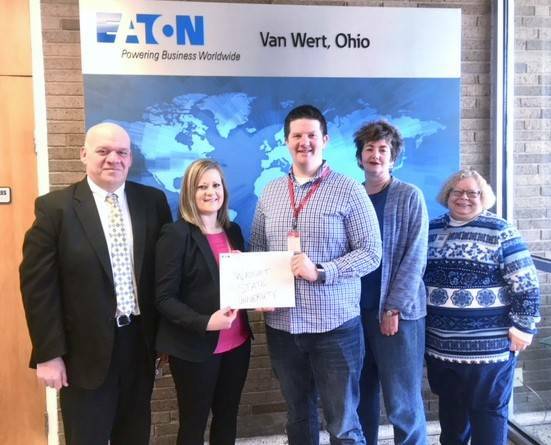 https://www.limaohio.com/wp-content/uploads/sites/54/2019/04/web1_JA_Brumback_Westwood-2018.jpgRenee Cryer, Eaton Van Wert contributions team member; Dee Densel, Eaton Van Wert contributions team member; Ashley Bultemeier, Westwood Behavioral; Krista Somerton, Junior Achievement; Scott Mull, Junior Achievement; Cory Michaud, Junior Achievement; Craig Hill, Eaton director of manufacturing operations; Jill Luginbill, Eaton engineer and Junior Achievement volunteer. Submitted photo. https://www.limaohio.com/wp-content/uploads/sites/54/2019/04/web1_Umadaop-2018.jpgShawn Wrathell, Eaton Van Wert HR manager; Craig Hill, Eaton director of manufacturing operations; Joycelyn Burks, UMADAOP housing coordinator; Marcell King, C.O.O. , UMADOAP; Dee Densel, Eaton Van Wert contributions team member; Renee Cryer, Eaton Van Wert contributions team member; Erika Lobsiger, Eaton Van Wert contributions team lead. Submitted photo. https://www.limaohio.com/wp-content/uploads/sites/54/2019/04/web1_Wright-State-adj-2018.jpgJay Albayyari, Ph.D. -Wright State Dean and Chief Administrative Officer, professor of mechanical engineering; Gretchen Rentz-Wright State; Shawn Wrathell-Eaton Van Wert HR manager; Kathleen MacDonald -Eaton Van Wert OPEX Manager contributions team member; Renee Cryer- Eaton Van Wert contributions team member. Submitted photo.